BENTON HARBOR, MI—Touting the appliance as a fun new way for kids to speed up their mornings, KitchenAid unveiled a spring-loaded toaster Friday that is designed to enable rad high school students to grab a piece of toast in midair on their way out of the house. 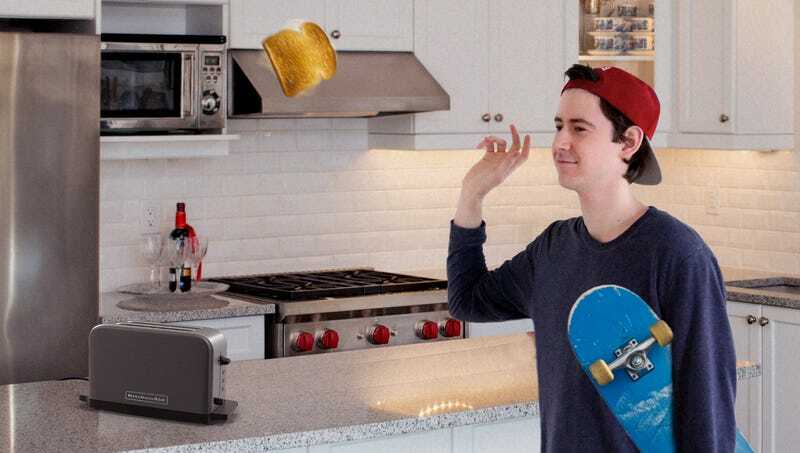 “This sleek, state-of-the-art pop-up toaster has been engineered to launch a piece of perfectly golden toast exactly 36 inches into the air, so it lands directly in the open hand of a wicked cool teen who is then able to exit through the front door without breaking stride,” said KitchenAid spokesperson Maya Caravigilia, adding that the toaster uses a patented millisecond timer to propel the toast upward at the precise moment, just after a totally awesome high schooler has slid down a banister, flipped their hat backward, and carelessly slung a backpack over one shoulder. “We get how uncool it is to eat breakfast unless you’re chowing down on a piece of toast while skateboarding around a mailman on the sidewalk who yells and shakes his fist at you as all his letters go flying. With its speed and midair reliability, our new toaster lets super-hip teens simply roll out of bed and head to school, causing elderly neighbors sitting on their porches to grumble about kids these days.” KitchenAid also announced the release of a constantly malfunctioning toaster guaranteed to burn toast to a blackened char for lame, uptight dads running late on their way to the office.